Phytophthora cambivora (Petri) Buisman (1927) causes root rot and stem canker on several forest species in Europe and North America. It causes ink disease of chestnut (Day 1938, Vannini & Vettraino 2001, Vettraino et al. 2005). Other hardwoods, especially members of the Fagaceae, such as European beech, chinquapin, and tanoak (rarely), are affected (Belisario & Maccaroni 2006, Nelson et al. 2010, Orlikowski et al. 2006, Reeser et al. 2007, Saavedra et al. 2007, Schmitz et al. 2007). Phytophthora cambivora is heterothallic, forming characteristic warty, or bullate oogonia with 2-celled antheridia when paired with the opposite mating type. 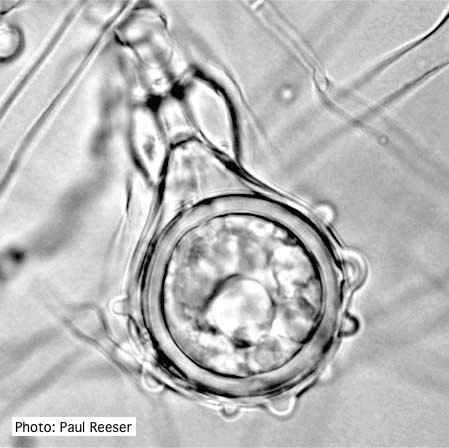 Sporangia are nonpapillate, about 55–65 μm by 40–45 μm, and broadly ellipsoid or ovoid. 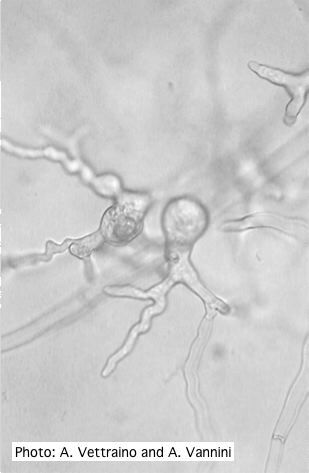 They are persistent, on simple, unbranched sporangiophores and exhibit internal, often nested proliferation as well as external extension of the sporangiophore. Chlamydospores are absent. Hyphal swellings are rare. 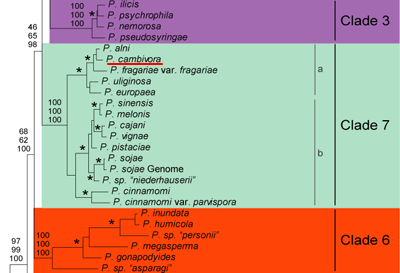 Phytophthora cambivora is in phylogenetic clade 7, with P. cinnamomi, with which it shares many features. It has been implicated in the complex hybrid genealogy of P. alni (Brasier & Kirk 2001). Different mating types predominate on different hosts and in different regions: isolates of P. cambivora from chestnut in Europe and from chinquapin in Oregon are mostly mating type A2 (Saavedra et al. 2007, Vettraino et al. 2005); isolates from other forest hosts in western North America are A1. Phylogenetic tree from http://www.phytophthoradb.org/species.php (Blair et al 2008). 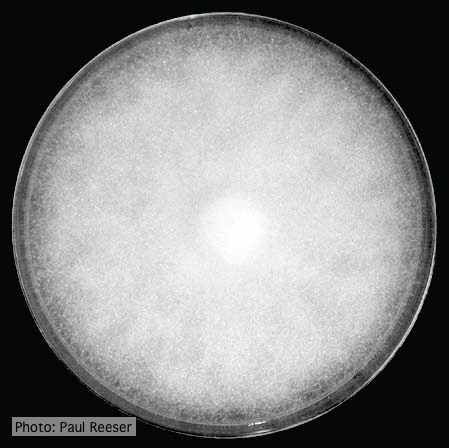 Phytophthora cambivora grows dense aerial, fluffy colonies without pattern on most agar media. 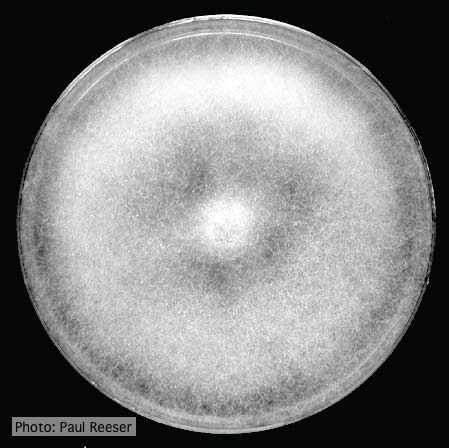 It is relatively fast growing (growth at 20°C on V8 agar 5.6 mm/d, on cornmeal agar with 20 ppm β-sitosterol 5.1 mm/d, on cornmeal agar with pimaricin, ampicillin, and rifampicin 4.6 mm/d, potato dextrose agar (PDA) 3.4 mm/d). The optimum temperature for growth is ca. 22–24°C, min. ca. 2°C, max. ca. 32°C. Colony morphology at 14 days on PDA (right) and V8 (left). 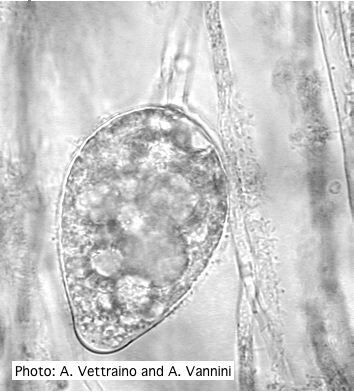 Phytophthora cambivora is relatively easy to identify, especially if the typical bullate oogonia and 2-celled antheridia are induced in a mating test. Look-alike P. alni is homothallic. The fluffy, patternless colony morphology on agar is distinctive. Sporangia are usually slow to form, and not abundant. They are non-papillate and generally non-descript. 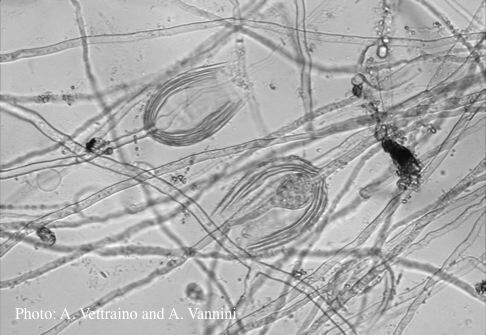 Phytophthora cambivora is very similar in appearance to P. cinnamomi and P. cryptogea, but can usually be distinguished by lack of chlamydospores. For more information about Phytophthora cambivora, visit our Disease, Education and Management materials, and Reference sections.